New Copic Classes and Exciting News! I hope you have a wonderful weekend ... I'll be back a little later with a CLASSroom project! I found a new (at least to me!) toy over the weekend . . . Dymo has a new 3/8" label maker called the Caption Maker. What's different about this one is that it's PINK and has three interchangeable font wheels that you can take out and change mid-sentence or even mid-word! I've used the upper & lower case here, there's also a lower case cursive font. If you click on the hyperlinked text above, that will take you to Dymo's site so you can see what the label maker looks like and also the fonts. But the price listed there is more than what I found with a Google search. I also got mine for less at my local Michael's . . . but I'm not certain you could find it in your local Michael's. This is a new prototype store Michael's is trying out in my area, since they are based here, and they had a lot better product than I've seen in other Michael's stores. Sorry my sentiment isn't showing up too well here, if you click on the photo for a larger view, it may be better. That's due in part to Dymo's new clear tape that I used to emboss on (OH, the possibilities!) and then applied it over some of the patterned paper I used in my project. I just had to rave a little bit about my new toy here . . . to see the rest of this project, please visit the CLASSroom today! These are both my projects that I've shared with you here on my blog: Sleighbells Ring and Apron Box & Invite. Isn't that a pretty ad? Thanks for sharing in my excitement! I hope to have another project for you tomorrow using Taylored Expressions' darling little Trick or Sweet gouls, witches & goblins! This card started off with a black base, which I punched in the lower right corner with SU's Word Window punch and tied light pink grosgrain ribbon thru the window. Then with Karen Foster's Snap Stamps, I made the sentiment "truely i do" and stamped it on whisper white cardstock with classic basic black ink. Then I positioned the sentiment behind the window, on the inside of the card and adhered it. Did you know Karen Foster decided to quit making these fabulous stamps? Many of you have them and if you don't know about them, you can form your own sentiments, sayings, etc. by snapping together each letter to form a word or even a longer sentence than this sentiment I created. Then you just simply stamp your newly created sentiment all at once, just like a custom pre-made stamp! AND they are reasonably priced, considering you get multiple letters in each pack. 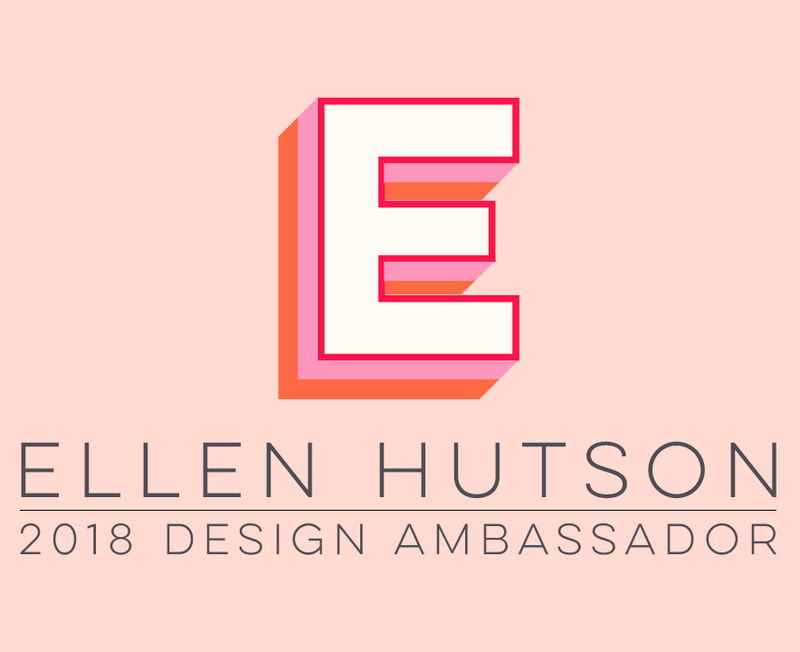 Ellen Hutson used to carry them in her store (she may still have a few left HERE) and found this out when she tried reordering them. But she says the people at Karen Foster ARE listening and you can make a difference by emailing them at: support@karenfosterdesign.com. So maybe if they hear from enough of us, they'll reconsider and even come out with some new fonts for us! So, back to the card :) . . . Then I matted this striped paper from Heidi Grace's Love Blossoms Collection with real red cardstock that I faux stitched with Uni-ball/Signo's white gel pen. The gel pen leaves a raised line, which gives the impression of real machine stitching. 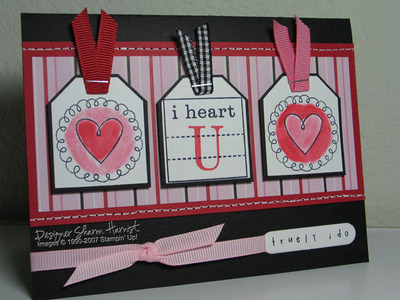 Next, I stamped the flowers and "i heart" square from Stampin' Up's Sweet on You on whisper white cardstock with basic black and punched them out with SU's large tag punch. I watercolored the images with an Aqua Painter and real red & regal rose dye reinkers and stamped the "U" from SU's Typeset Alphabet Upper in red ink. I adhered the images to black cardstock and free-hand cut the mats. Then I stapled red, rose & black gingham ribbons on the tags and mounted them with dimensionals to the striped paper. (Whoa -- looking back, that's a LOT of ribbon!) Voila', all done! 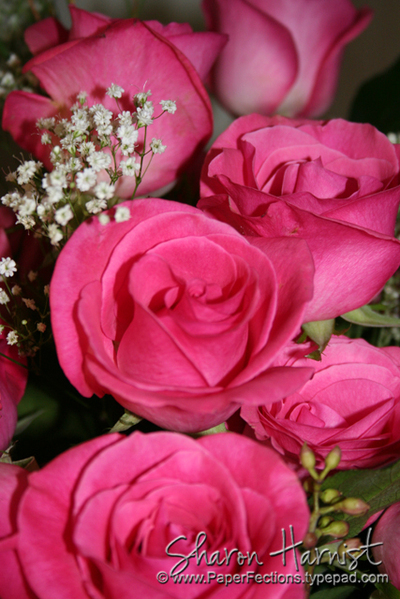 So, hubby DID end up getting me a great gift for our anniversary (even after the camera for Mother's Day) AND more roses! So I hope to get a little project completed today and have it to show to you a little later, so check back in! Ranking right up there with tulips as my one of my favorite flowers is roses. I'm so sad this Stampin' Up! set is retiring this year -- Roses in Winter. This card started with a real red base, then a layer of pretty in pink which the Sincere Salutation sentiment is stamped on in classic basic black ink. 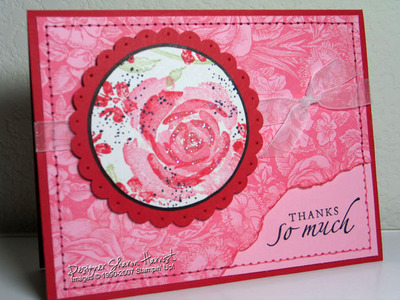 The Floral background was stamped with regal rose on pretty in pink and the lower right corner torn and inked with red. 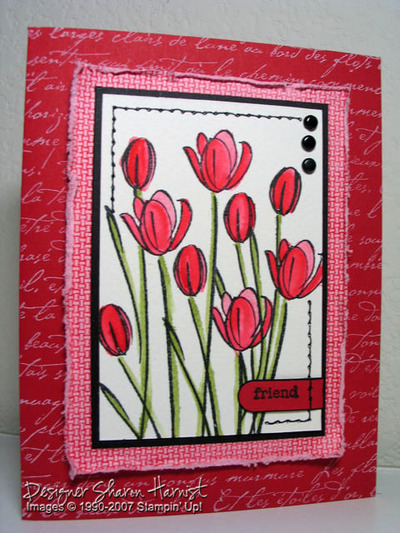 These two layers were faux stitched using a real red Stampin' Write Marker. That's the nice thing about faux stitching -- you always have just the right color of "thread"! For the focal image, I inked the largest rose piece in this 3-step stamp (bottom layer) with pretty in pink that was lightly rock & rolled in regal rose ink. The middle layer/stamp of the rose was inked with regal rose then rock & rolled with red ink and stamped. The last/top layer of the rose was stamped with red ink. The small flowers were stamped in red, the leaves in stamped off mellow moss and Itty Bitty Background dots stamped in black, all on shimmer white cardstock to give these flowers a pretty shimmer. To add a little more shimmer, I used 2-Way Glue pen and Dazzling Diamonds glitter on the center parts of the rose. This piece was cut with the circle Coluzzle template. I matted the rose piece with a Marvy Giga Scalloped Circle Punch of real red and then thought it needed more black to make the image pop but didn't have the correct size of cutting circle template to give it just a sliver of black mat that I wanted. So I used the 2.3mm Stampin' Write Journaling marker to draw a thick line around the rose circle -- a perfect mat! 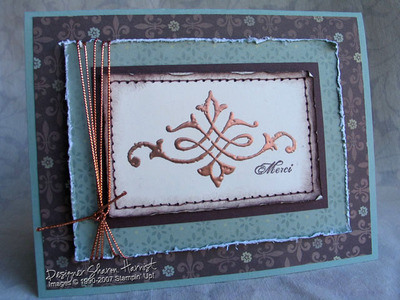 To finish off this piece, I used the paper piercing pad, template & tool to punch holes in the centers of the scallops and mounted this piece with dimensionals to the card. A piece of narrow white organdy ribbon finishes the card. I'll be putting each of these faux stitching cards that were featured in the Take Ten article over in the "My Published Work" gallery on the right sidebar of my blog. So while I'm waiting for my comp copy to arrive, I thought I'd share those cards with you over the next few days and tell you how I made them since the article only lists stamp credits, I believe. If you don't know what faux stitching is and/or would like to see a tutorial on it, click HERE to see the tutorial I wrote (with photos) for SplitcoastStampers.com (link is also over on the top left side of my blog, under the "Visit My" links). Card base is real red, with French Script stamped in white craft/pigment ink. 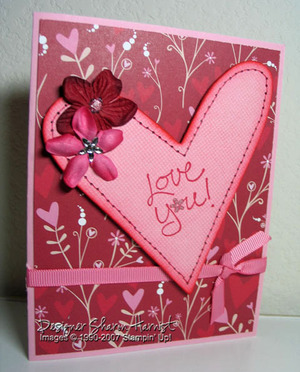 The next layer is Aida Cloth stamped in real red classic ink on pretty in pink cardstock and the edges are distressed; it is mounted on dimensionals. Both Way Blossoms' tulips were stamped on shimmer white cardstock with StazOn black ink and watercolored with an Aqua Painter and reinkers: pretty in pink, real red & celery. 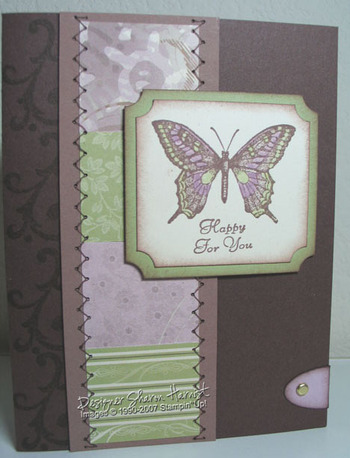 Faux stitching was created with the Crafter's Tool Kit paper piercing tool, mat & template. Stitching lines were drawn with black Stampin' Write Marker. Tulip image was matted with black cardstock and the black Vintage brads added. I stamped the word "friend" from Everyday Flexible Phrases in black on red cardstock, punched it out with the Word Window punch and sponged the edges with black ink. So there's card #1 . . . check back each day for the next week for a new card!